An elevated deck without stairs is a design trend that’s ‘rising up the popularity meter’ among some St. Louis homeowners. Often referred to as a ‘balcony deck’, this type of outdoor structure becomes an extension of a home’s upper-floor interior, usually accessed by sliding glass or French doors. And by extending an interior room to the outside, a balcony-style deck will make the room seem larger than it really is while adding a green element to the space too. Think about it this way. It’s a very large balcony with absolutely no connecting stairs to a lower level deck or to the backyard. Yet, unlike a Romeo-and-Juliet-style-balcony, these posted structures will have much more useable space. Initially this elevated design might appear counterintuitive. Why would someone want to have a second-story deck with no backyard access? Well, as it turns out, there are several distinct advantages to building a balcony deck for your two-story home including architectural design interest, privacy, security and cost savings. Balcony decks offer architectural interest with custom balustrades and a unique space for container gardens. First, safety rails are required for municipal codes but balcony-deck railings provide much more than just safety. One of the quickest ways to change the appearance of a home’s exterior is to highlight the balustrade that ‘frames’ a deck’s floor surface. And with the custom railing designs that are available nowadays, customers can totally rock any style they choose. Second, deck gardens are popular and stylish. They were first seen in urban areas with limited outside space; however decks in the suburbs are now a popular place to grow flowers, plants and food in colorful pots, fancy urns or attractive window boxes specifically designed to hang on railings. Greenery adds interest to any outdoor space and container gardening isn’t just for apartment dwellers and urbanites anymore! 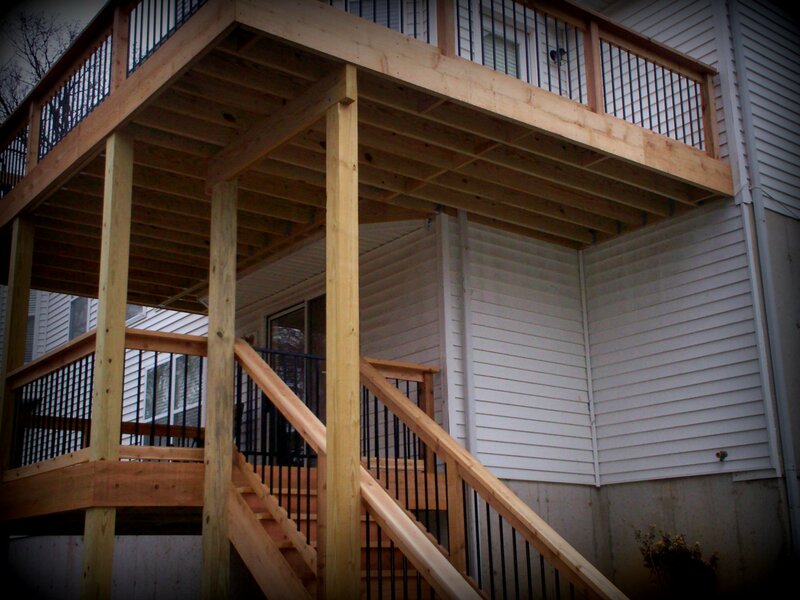 A balcony deck, alone or with a screen room, offers homeowners substantial privacy too. An upper balcony without a lower level connection has the feel of a true ‘getaway’ spot. And security-wise, some customers prefer that there’s no easy access to the second story of their home via the backyard. The design is a fantastic structure to accentuate a view with plenty of privacy and sunshine up-top, and adequate shade below. By eliminating one or more set of stairs, obviously the price of the project is reduced by erasing extra material and labor costs that are involved in staircase construction. Some customers elect to save the money, period. Other customers use those budget resources toward other project features – lighting, furnishings or landscaping. 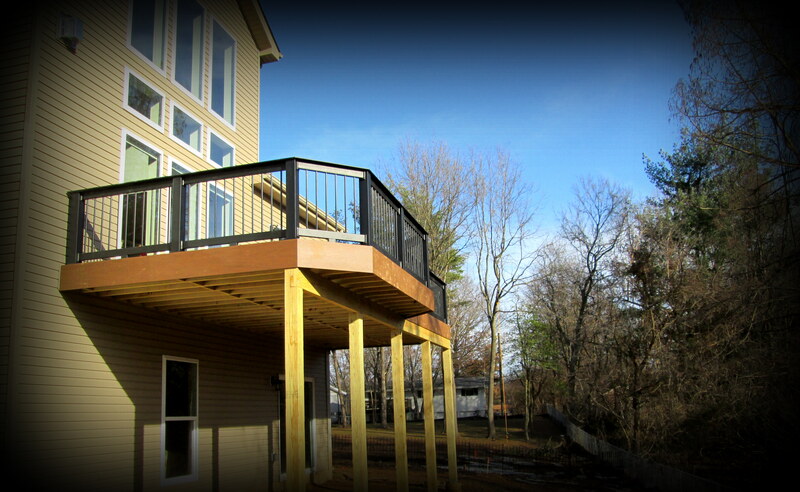 So if you live in the St. Louis, Missouri region and are looking for a reputable contractor for a deck, screened porch or other outdoor living addition, please consider Archadeck. We’re located in St. Louis West County and serve all areas of St. Louis, St. Charles and the surrounding localities. Call us anytime at 636.227.0800. And be sure to visit our website – west-county.archadeck.com – to see hundreds of our completed projects for homeowners throughout the area. Outside of St. Louis, visit archadeck.com for other locations across the U.S.